„People become noble by spirit and character, not by birth and title.” – wrote Johann Wolfgang von Goethe. We know that the world famous Sherlock Holmes is a strong-backed man with a powerful spirit. Similar were his creator, Sir Arthur Conan Doyle and his first illustrator, Sidney Paget. We can rightly call both renowned Englishmen the fathers of the great detective. But the genius of Holmes became complete with having another wonderful, true friend besides the good dr. Watson – this friend was the thrilling American actor, William Gillette. Gillette was born into a wealthy family. His father was a senator, while his mother was the descendant of a reverend who founded the town of Hartford. William was well-educated and his parents took care of his spirit too, so no wonder that the talented boy grew up to be a soulful man who often relied on his thoughts. He dealt with many things during his life, he was an actor, playwright, director, stage-manager and even inventor. Most people would overlook the line because of the joy of having the permission. But Gillette took the time to think over Doyle’s situation. When they met personally, he not only read out his play to the author, but maybe he said some encouraging words. After so many swindlers and idiots who wanted to steal and dishonour the figure of Holmes, Doyle finally met someone who truly respected not only his hero, but the author himself too. He felt that William appreciated him as a man and as an artist. Gillette did not simply want to take away Sherlock, he gave something in return, something that was as precious as the fictional character – his devoted friendship. „A friend pays attention to the things that move me. A friend pays attention to the things that are inside of me, wants to discover the basic melody of my life. And if I forget this melody because of the challenges of everyday life, he plays it for me. With his help I can reach my inner self again. He reflects who I am.” – wrote Benedictine monk and writer Anselm Grün. Such a friend was William Gillette, he was there to help Doyle through a tough period of his life. We can even say he was like a doctor who helps his patient in a critical moment with a life-saving operation or a transfusion of blood. With his words he found the way to Doyle’s heart and soul, giving him fresh energy and encouraging him to hold on. The famous author received this transfusion of blood when he needed it the most. Gillette made him to like his creature again. After their meeting William received a letter from Arthur, stating it was good to hear from Holmes again. Sherlock became their common favourite, and they began to work on his character together. Gillette was a great partner in this process, who brought new colours to the life of Doyle. It was the actor’s idea that Sherlock has to wear a deerstalker onstage, and while rehearsing a scene he found out that using a calabash pipe will be very useful (he could pronounce more easily). He used the violin and the syringe as props. The famous line „Elementary, my dear Watson” originates from him too. Conan Doyle willingly accompanied him on several tours, and his opinion was that Gillette used the magnifying glass and the other props masterfully. Sometimes it is said Gillette’s Holmes was unemotional, but he was exceptionally sensitive of outward details, he used these instead of a romantic attitude to make appeal. But we have to bear in mind that the legendary sleuth was quite like a machine. Both him and Gillette were very sympathetic, though they made their way in life using their outstanding ability of thinking and deducing. They were rather introverted, but they could find out how others feel and they could help when it was needed the most. Gillette helped Doyle, while Holmes helped his clients. They seemed to be unemotional, but they had a kind heart. (You can read more about the characteristics of the great detective in the following article: Sherlock Holmes characterization). For Sherlock his profession is the most important thing in the world – the situation is the same with Gillette. As we already mentioned, he was an inventor, he applied for four patents (one of them was a new method of simulating sounds). So he liked to experiment, just like Holmes. The most famous detective of the world lived in a convenient flat at 221B Baker Street. Gillette also had a comfortable home where he could relax after a hard day. His castle – which is now a state property with its park – is simply astonishing. No wonder that such famous friends of the actor visited it as his guests like Albert Einstein, Calvin Coolidge, Mark Twain, Helen Hayes or the mayor of Tokyo, Ozaki Yukio. Of course Sir Arthur Conan Doyle had been there too. For Doyle Gillette was the perfect Sherlock Holmes actor, and they became lifelong friends. In the famous black-and-white documentary he is asked how had he been able to write such fantastic adventures for the sleuth. He tells it was hard but he always had friends to rely on when he had no inspiration. Undoubtedly one of those friends was William Gillette. The fascinating actor befriended not only Doyle, but his hero, Sherlock Holmes as well. The famous actor portrayed Holmes more than 1300 times onstage. Just like the genius of Baker Street or the moustached literateur, he also believed in God. There are several crucifixes in his wonderful castle. Their faith gave these men strength in hard times. According to the famous painter, Salvador Dalí, a true artist not only has inspiration, but he/she is able to inspire others. It is an unimpeachable truth. William Gillette was such a true artist – he inspired Doyle with lots of love. 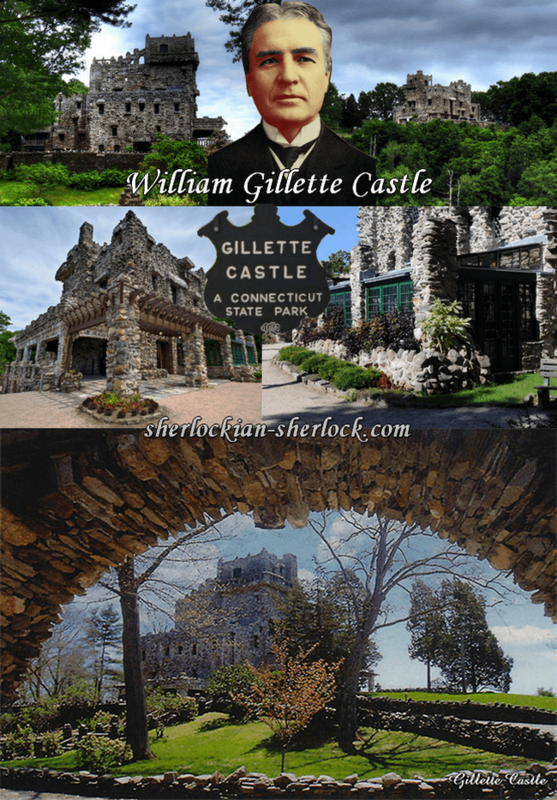 In connection with the deerstalker, the calabash pipe, the films, theatre plays, posters, book covers or the biography of Conan Doyle the name of William Gillette is frequently mentioned. Most often it appears because of his castle. But the monumental building is much more than an attraction for tourists, it reflects the style of a gorgeous artist. It was the beloved retreat of a distinguished man, the friend whom Doyle and Sherlock Holmes could rely on. And if we talk about the fact that Sherlock is not solely a British character, because other nations love him too (the USA specifically), we can proudly recall the name of William Gillette, who did a lot to make Holmes so wonderful as we got to know him. For Sir Arthur Conan Doyle, for the famous illustrator Frederic Dorr Steele and for his contemporaries William Gillette was the perfect Sherlock Holmes. Peter Cushing, Ronald Howard and Vasily Livanov.